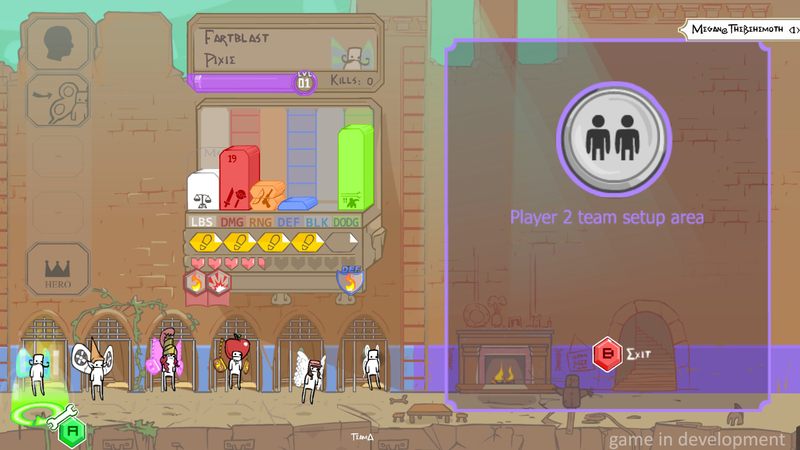 We’ve shown you several types of fighters in previous Pit People reveals, such as Robots & Mushrooms, but this next one may just be too hot to handle. If you like playing with explosives & fire, then the fighter of your choice could be our Pixies! 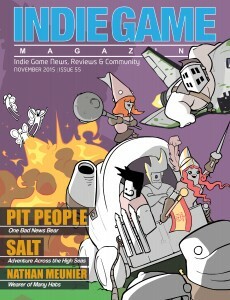 Indie Game Magazine recently did a cover story on Pit People where we talked about the game development at length and highlighted the Pixies for the first time. If you haven’t had a chance to read it, we highly recommend getting a copy of the issue HERE. It has lots of colorful pictures and delicious words in our interview with IGM. Pixies create explosions from their spindly hands that rain fire everywhere, but they can only attack by leaving one hex between them and their target!! If they’re floating right next to the enemy, then their attack is out of range. These beautiful creatures are graceful but unpredictable depending on the environment–unless you know how to harness their power and your surroundings. The explosive and fiery attack by a Pixie can also have a rippling effect depending on the flammability of the level. While dirt terrain may not catch fire, an attack made near any foliage may cause a potential wildfire. This fire can burn for multiple turns before calming down! Walking through this fire can burn, but flying units have no problem at all. The rules of nature still apply even in a post apocalyptic world! You’ll also notice in the GIF above that if you have a Pixie on your team then those Pixies are generally resistant to fire attacks–it wouldn’t make sense for them to create chaos that they can’t handle with such fragile, supple bodies! Pixies have a higher chance at dodging many enemy attacks compared to other fighter types. But, you’ll still need to be cautious when you see any electricity wielding enemies. Look out for those Robots from the future! Last, but not least, let’s talk about customization. Pixies can wear anything that Humans can wear upon their noggins. These items can be changed in your “House” in the Pit People city. If you find extra wings, you can swap them out on your very own Pixies! Look at all the shapes, sizes and colors on these fighters! Just like any other accessory in Pit People, these Pixie specific items could pop up for purchase in the Market (if you already have a Pixie in your team), they could be potentially acquired through loot & rewards, or you could always Recruit a Pixie in battle if they have the desired gear on their being. Mix and match wings and head gear as you wish! Finally, just like any fighter type on your team, you could make a Pixie into a Hero. But you only get to have one Hero on your team —-> so choose wisely! Which Pixie look is your favorite? Let us know in the comments section below!